Ayear after I did it, I’m still not sure why I decided to walk the Camino de Santiago. Why would a middle-aged man take six weeks off work to tramp 800km across an age-old pilgrim trail in the north of Spain with his 30-year- old son when he had so many more “important” things to do in his life? Attention has been focused on the trail by movies such as Martin Sheen’s The Way and best-selling novels such as Paolo Coelho’s The Pilgrimage and Shirley MacLaine’s The Camino and it now attracts about 100,000 walkers each year. Known as the Way of Saint James in English, Le Chemin de St Jacques in French, Jakobsweg in German and El Camino de Santiago in Spanish, this path has been attracting “pilgrim” walkers to Spain for more than 1000 years. 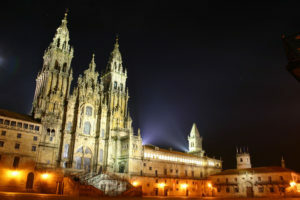 Legend has it that the relics of Saint James, one of Jesus’ 12 apostles (called Santiago in Spanish) are buried in the magnificent cathedral of Santiago de Compostela in north-west Spain. Since the relics were discovered in the 9th century, devout pilgrims have been trekking there from all over Europe. The Way consists of several trails originating in different parts of the continent that converge on Santiago but the most popular route, and the one that we took, is the Via Frances that begins in the little town of St Jean Pied de Port at the foothills of the French Pyrenees and traverses northern Spain. Six to seven weeks walking the Camino is a great way to get to Santiago – allowing you to enjoy some breathtaking scenery in addition to sampling Spanish culture, food and wine in the company of like-minded folk. And it’s not just devout Catholics who make the long walk to Santiago. Pilgrims of various nationalities and religious persuasions undertake the walk for a variety of reasons. Recognising the economic contribution of so many thousand visitors, the regional governments of Spain ensure that The Way is clearly marked and well maintained.